There's very little I love more than a good road trip. Winding my way along rocky coastlines, waves crashing up against the rocks, serpentine back roads leading to unexplored coves and inlets, fresh seafood and local wine in ramshackle structures on the beach- this is truly my happy place. Epic road trips - the ones that you will talk about for a lifetime - are about adventure and curiosity and being open to experiencing the unexpected. They're about inspiration and beauty and choosing to take the long way. They're about sunbathing on the rocks, and sipping sundowners on Adirondack chairs as the fog rolls in. But most of all they're about living in the moment and making memories. So put together a great playlist for the car, grab your camera and your favorite travel companion and get ready to set off on a new adventure! What I love about Rhode Island is that it offers a little something for everyone. With over 15 state parks, 7 state beaches and 5 public use lands in Rhode Island alone, this road trip is ideal for nature lovers. There are also 21 lighthouses in the area, to satisfy those who enjoy some history. Is art more your thing? Then how about checking out the Rhode Island School of Design (RISD) Museum of Art which houses a wide-ranging collection from ancient Greek sculpture to contemporary paintings. Newport's Grand Mansions such as the Breakers, Marble House and Rough Point, are filled with art, as is the Newport Art Museum, with collections reflecting Newport and southeastern New England and contemporary artists. This area is also a foodie paradise with wonderful ocean-to-table dining options. And I'm not just talking Michelin stars and white tablecloths - think picnic tables along the water and plastic cups of local New England wine or beer to wash down the succulent lobster, fried clams and oysters, crab cakes, clam cakes, lobster rolls, hush puppies - the list goes on. This is New England - it's magical, haunting and serene - and one visit simply is not enough. Providence is a great base for this trip. There are some lovely boutique hotels in the area, but also a number of outstanding Airbnb properties in the city and closer to the airport. Centrally located, most other sights are all within an hour by car, so day trips from Providence are easy to plan and navigate. Plan to arrive in the early afternoon, pick up your rental car and set off for lunch at a Rhode Island Institution - Flo's Clam Shack in Middleton, RI. Flo's Clam Shack - Although they've got a great seafood menu, Flo's Clam Shack really is all about the clams. It's not fancy, but it's fresh and definitely worth a stop. Located about 45 minutes from Providence, Flo's has been around since 1936 and has survived 5 hurricanes! Flo’s Clam Shack opens for the season in early March and closes Halloween weekend. They serve up baskets of tender, sweet, plump clams, lightly battered and fried to crunchy perfection with lemon wedges and tarter sauce for a nice fresh tang to each bite. There is great debate in New England about what is better - whole belly clams or clam strips, which are cuts of larger surf clams. I could tell you what most New Englanders prefer, but why not order a basket of both and decide for yourself? Other must try items include Flo's famous clam cakes and Flo's fiery stuffed Quahogs. Add some local beer and you have the makings for a delightful afternoon of enjoying your food as you take in the view from the top deck. After lunch head across the street to Easton beach and take a long, leisurely stroll along the water. As you walk down the beach taken in the view of the Newport Mansions, visible on the rocky cliffs along the shoreline to the right. Head back to the car after your walk and drive through Newport on your way back to Providence. If you're lucky you'll find the perfect spot to pull over and catch the sun setting over the water. NOTE: Toll roads are common along much of the Northeast coast. There are plenty of alternate, non-toll roads available, but you may want to do a quick check of the map before heading out to give yourself a sense of which route will work best for you. Enjoy a slow morning as you sip your coffee and take in the views in and around Providence. Plan to head out mid-morning and drive about an hour to the small village of Mystic, Connecticut, situated within the towns of Groton and Stonington. Settled in 1654, Mystic was originally a shipbuilding seaport village and safe harbor for tall ships to weather storms. Known for all things maritime, this quaint and colorful little village is filled with mom and pop shops and eateries along Main street. Covering just 4 square miles, Mystic has numerous attractions including the Mystic Seaport, Mystic Aquarium, Denison Homestead, Mystic Museum of Art, Olde Mistick Village, an art museum and a number of galleries. B.F. Clyde’s Cider Mill, the only steam powered cider mill in the US is a favorite fall time tradition that keeps people lining up for cider and fresh donuts. Mystic Pizza - Known as the setting for the classic 80s movie (which is a "must watch" as part of any pre-trip preparations) Mystic Pizza may seem a little kitschy - but who among us couldn't use a little more kitsch in our life? Although it's been around since 1973, it became a destination after screenwriter Amy Jones, who was summering in the area chose Mystic Pizza as the focus and setting for her story of the lives and loves of three young waitresses. The movie was filmed on location in Mystic and neighboring towns. I'm not sure how people feel about the movie, but Mystic Pizza the restaurant is beloved by locals and tourists alike. Bascule Bridge - Mystic in not a legally recognized town, but rather is known as a zipcode village within the towns of Groton and Stonington. The Mystic River divides the village into an eastern side (Stonington) and a western side (Groton). 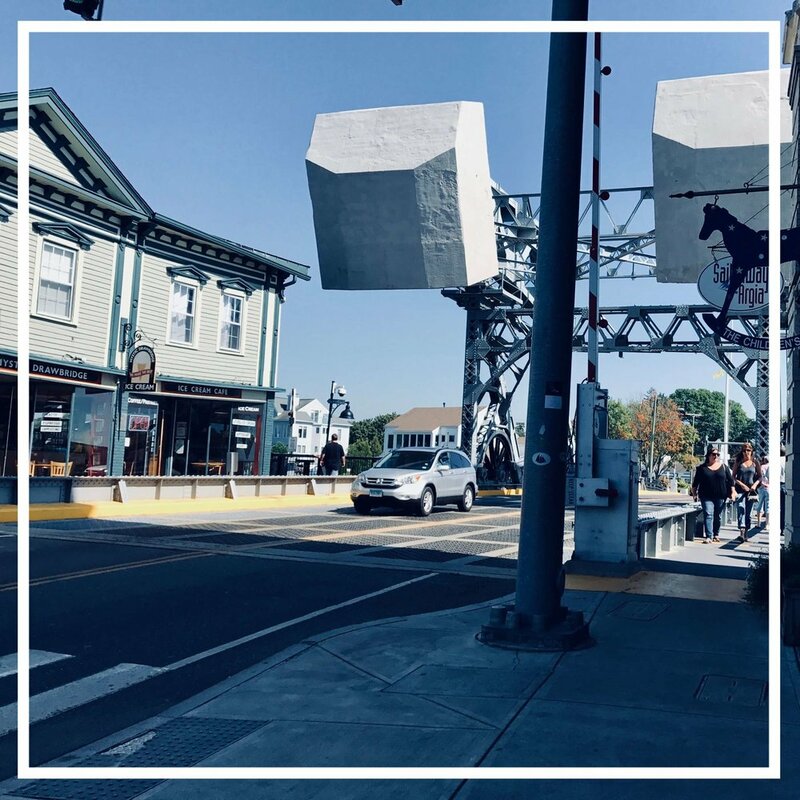 The Bascule Bridge, located in downtown Mystic on Main Street, opens once every 60 minutes at 40 past the hour during daylight hours/seasonally May through October or on demand. Meander through the shops along main street to pick up souvenirs and gifts. A can't miss for foodies is the The Spice & Tea Exchange housing an impressive collection of spices, herbs, salts, fine teas, and custom blends. The Old Lighthouse Museum - After walking through town get back in the car and take a short 15 minute drive to neighboring Stonington, Connecticut, home of the historic Old Lighthouse Museum. For more than 170 years, this stone lighthouse tower and dwelling have stood at the entrance to the harbor of Stonington, Connecticut’s only port facing the Atlantic. Regarded as a durable symbol of a seafaring past, in its working years it was used to guide ships across the treacherous Fishers Island Sound. The building is notable among lighthouses of its period for its ornate stonework, ornamental cornices around the tower, and weighty granite lintels above doorways and windows. Visitors may climb the 29 circular steps and a short ladder to reach the top of the tower, which looks over three states – Connecticut, Watch Hill, RI and Fishers Island, NY. Stonington has been voted one of the “Top 10 Prettiest Coastal Towns in New England.” Its quaint tree-lined streets flanked with historic homes makes it ideal for strolling and finding all kinds of treasures in one of its numerous antique shops. Wine Tasting in a World War II Airport Hangar - The natural environment of coastal Connecticut is ideal for growing grapes. 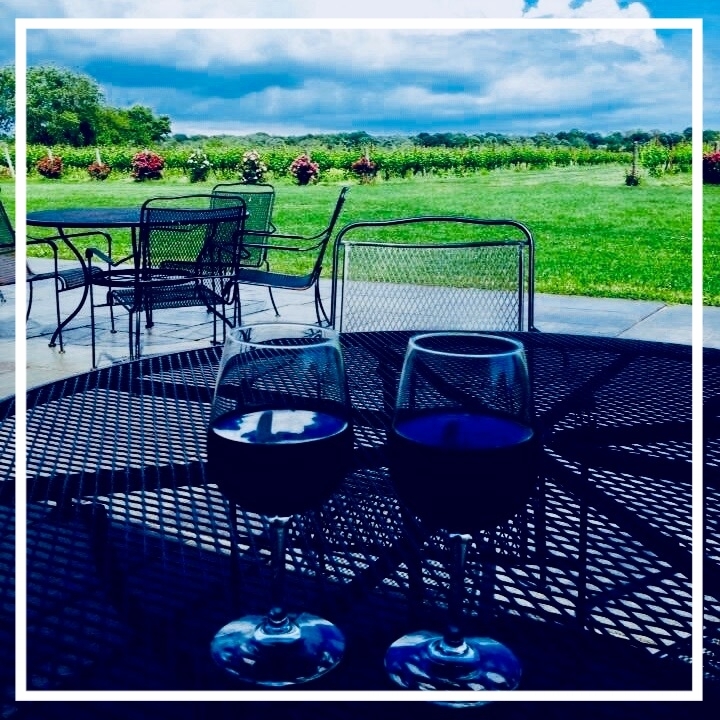 Wineries in this region produce award winning varietals that can be found in many of the local restaurants around town and in wine shops across the country. My favorite is Saltwater Farm Vineyard in Stonington, Connecticut. Embracing its deep history, Saltwater Farm Vineyard is dedicated to its roots and prides itself in preserving both the heritage of its coastal Connecticut farmland, as well as their unique WWII-era private airport. Go on a tour to learn about the history of the vineyards and the wines they produce before heading to the beautiful tasting room found in their restored 1930s era airplane hangar. Make sure to ask for a chilled bottle of the sauvignon blanc or estate chardonnay to take along to dinner. Abbots Lobster in the Rough - Don't let the rustic setup fool you - Abbott's t Lobster in the Rough has a reputation for having some of the best ocean-to-table dining in the area. Located in the coastal town of Groton, Connecticut, Abbott's does not take reservations, opting instead to follow a first come first served approach Abbott's serves a wide range of seafood, but they're best known for their lobster - freshly steamed and served with drawn butter, potato chips and coleslaw served on plastic plates and cafeteria trays. Grab a seat at one of the communal tables set up outside and settle in for a feast. Although they do have a small seating area inside, it's rather steamy and definitely doesn't have the same views as you get sitting out by the water. Keep in mind that Abbott's doesn't serve any alcohol, so if you're looking to pair that succulent lobster with some bubbly or local beer you'll definitely want pick up your drink of choice on the way over. Today is about exploring and getting lost and finding treasures along the way. It's about feelings of wonder and awe as you experience the natural beauty that Rhode Island has to offer. After breakfast, grab some coffee or tea to go, put on your favorite driving playlist, and hit the road. The picturesque route noted here is one of my favorites and affords many opportunities to stop along the way to simply take in the view and capture some gorgeous photographs. Head out of Providence and hop on US 1 S to Narragansett. Take the exit toward Point Judith/Scarborough/RI-108 from US 1 to Ocean Road and drive until you get to Scarborough State Beach. This is a great place to get out and stretch your legs a bit and take in the fresh sea air. From here take RI-138 E in North Kingstown from Ocean Road and RI-1A N/Boston Neck Road to take the coastal route towards Beavertail State Park in Jamestown. There are many little turnoffs along this route that lead to secluded little coves and breathtaking views of Narraganasett Bay - well worth diverting from this route for a bit. Follow RI-138 E to Tashtassuc Road in Jamestown and take the Helm Street exit from RI-138 E and on to the North Road to Beavertail Road. Follow the road until you get to the Beavertail Lighthouse Museum. Beavertail State Park - Beavertail State Park, located in Jamestown, Rhode Island, is known for offering some of the most beautiful vistas along the New England coastline. The Park allows visitors to sightsee by car in one of the four overlooks, or on foot along the rocky coastline. Beavertail also provides some of the best saltwater fishing in the area, along with offering hiking trails, and a naturalist program that attracts hundreds of people each year. Located on the southernmost tip of the park is the Beavertail Lighthouse, the third-oldest lighthouse in the United States. The adjacent museum provides a rich historical overview about the construction, the battles in the area during the Revolutionary War, and stories about the various lighthouse keepers and their families. In Search of the Best Lobster Roll - Foodies coming through New England are generally on the hunt for the best lobster roll. There are plenty of options, but one of my favorites is Anthony's - a seafood market and restaurant filled with locals over the lunch hour. Located in Middleton, Rhode Island, Anthony's sits just outside of the high-end area of Newport and serves up heaping, nearly half pound lobster rolls filled knuckle, claw and tail meat and tossed with celery, a hint of mayo and pepper on a perfectly grilled bun. In true lobster-roll-pro fashion, a piece of lettuce placed between the bun and lobster helps prevent sogginess in these crafted-to-perfection rolls. They come served with fries, coleslaw and a pickle, and paired with a local beer make for a perfect post exploration lunch. Newport Mansions - Some of America's wealthiest families, including the Vanderbilts, the Astors and the Morgans summered in Newport, Rhode Island for six weeks or so out of the year. By day they raced their yachts in Narragansett Bay, relaxed at Bailey's Beach, and played tennis at the Newport Casino (the current site of the International Tennis Hall of Fame) on Bellevue Avenue, and by night they hosted extravagant parties in their lavish summer homes. 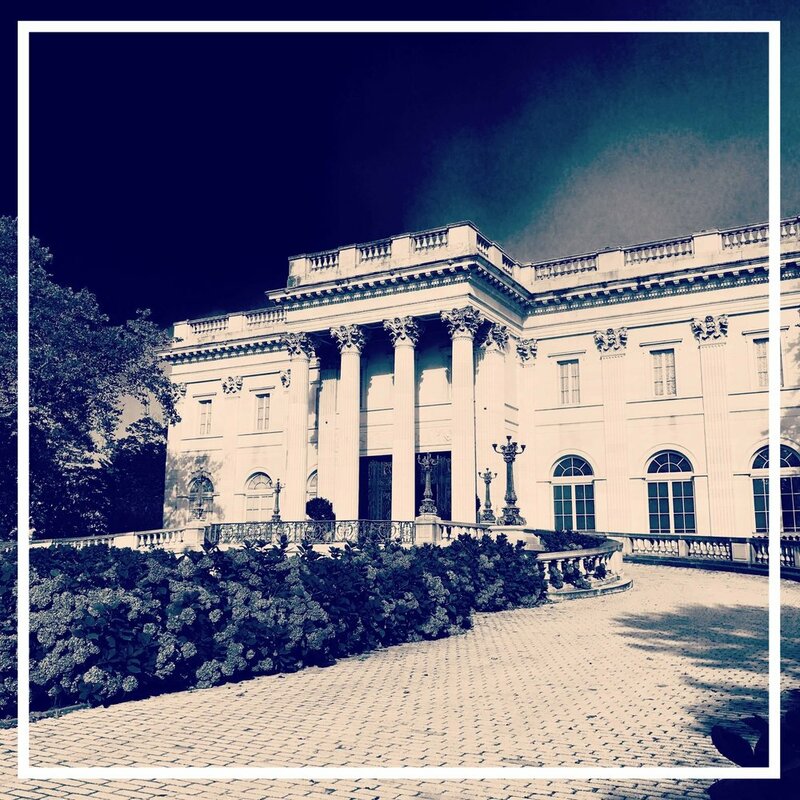 The architecture alone is phenomenal and for those who want to learn more about the history of the Gilded Age, the Newport Mansions also offer docent-led tours and self-guided audio tours. Another great option depending on your time and energy is to stroll along the Newport Mansions Cliff Walk, a public access walkway that borders the eastern coastline along the backside of the mansions. From the mansions head south on Bellevue Avenue, right on Coggshall Avenue, and left on to Ocean Avenue and follow the winding road along the water towards the final destination of the day - the Castle Hill Inn in Newport, Rhode Island. Sundowners at Castle Hill Inn - Perched on top of the sand dunes is the Castle Hill Inn, a boutique hotel made up of cottages with views of the peaceful New England cove. Head over to the bar for a blueberry lemonade or any one of the other creative craft cocktails on their menu. Take your drink and head out to the Adirondack chairs that dot the green lawn and settled in. With sweeping views of the Narragansett Bay and the Rhode Island Sound, this is the ideal place to take in the serene beauty of the area and reflect. On clear days you can see the bridge that connects Jamestown and Newport as well as the numerous lighthouses in the area. Some days you can catch the fog rolling in and witness the mesmerizing sight of ships emerging from the thick haze. The Lawn and the Dining Room both provide dining options, though reservations are recommended. Another great option is to head back towards Newport and grab dinner at Pasta Beach - a fantastic little Italian place with solid fare and a lovely al fresco dining area. The Duck and Bunny - If your flight doesn't leave until later in day, make one final stop at The Duck and Bunny, a charming little eatery in the heart of Providence. Described as a snuggery, this little gem is cozy and was designed to be as much of a work of art as the food itself. The owners wanted a place "that even the most jaded could find solace in. " This little snuggery is a sanctuary tucked away from the hustle and bustle of life and the perfect way to avoid going back to real life for just a little bit longer. If you go, don't miss the truffled home fries and any one of the Eggs Ben -a -Ducks. End your trip by getting one of the housemade gourmet cupcakes made on the premises - to take with you on the road - of course.